Murine bone marrow (BM) NK T cells can suppress graft-vs-host disease, transplant rejection, and MLRs. Human BM contains T cells with similar potential. Human BM was enriched for NK T cells, ∼50% of which recognized the nonpolymorphic CD1d molecule. In contrast to the well-characterized blood-derived CD1d-reactive invariant NK T cells, the majority of human BM CD1d-reactive T cells used diverse TCR. Healthy donor invariant NK T cells rapidly produce large amounts of IL-4 and IFN-γ and can influence Th1/Th2 decision-making. Healthy donor BM CD1d-reactive T cells were Th2-biased and suppressed MLR and, unlike the former, responded preferentially to CD1d+ lymphoid cells. These results identify a novel population of human T cells which may contribute to B cell development and/or maintain Th2 bias against autoimmune T cell responses against new B cell Ag receptors. Distinct CD1d-reactive T cell populations have the potential to suppress graft-vs-host disease and stimulate antitumor responses. Murine NK T cells were originally identified based upon expression of NK1 (NKR-P1C, CD161) and ability to rapidly produce large amounts of IL-4 and IFN-γ (1, 2, 3). A large fraction of murine NK T cells are CD1d specific (4), with an invariant α-chain rearrangement and preferential Vβ usage (invariant NK T cells) (1, 2, 3). The homologous human CD161+ CD1d-reactive T cell population with an invariant TCR α-chain (Vα24-JαQ) paired preferentially with Vβ11 represents <0.1% of human peripheral blood T cells (5, 6). CD161 is the major costimulatory molecule for human invariant NK T cells (7). Nonetheless, CD161 is not exclusively a marker for CD1d-reactive T cells, particularly in humans where >5% of peripheral blood T cells express CD161 (8). A fraction of human CD161+ T cells are reactive with CD1a, CD1b, or CD1c (6), molecules missing in the mouse. Further murine CD161+/− CD1d-reactive T cells with distinct Ag specificities and using diverse TCR can discriminate between CD1d expressed on different cell types (9, 10, 11, 12, 13, 14). Similarly to invariant NK T cells, murine noninvariant CD1d-reactive T cells can produce Th1 and Th2 cytokines, but it is not known whether the functions of these two populations are distinct. Human noninvariant CD1d-reactive T cells have not yet been reported. The spectrum of roles for CD1d-reactive T cells remains to be defined, but studies in mice have indicated these cells participate in protection against tumors, certain autoimmune diseases, and viruses (1, 2, 3, 15, 16, 17, 18, 19). Invariant NK T cells represent up to 50% of murine intrahepatic lymphocytes (1, 2, 3). Human liver contains detectable numbers of cells with an invariant NK T cell-like phenotype (20). Murine bone marrow (BM)3 is enriched for noninvariant CD1d-dependent NK T cells (11, 13, 14). Murine BM T cells can suppress acute lethal graft-vs-host disease (GvHD) and MLRs, but the relationship between these functions and CD1d-reactive T cells also remains unclear (21, 22, 23, 24). 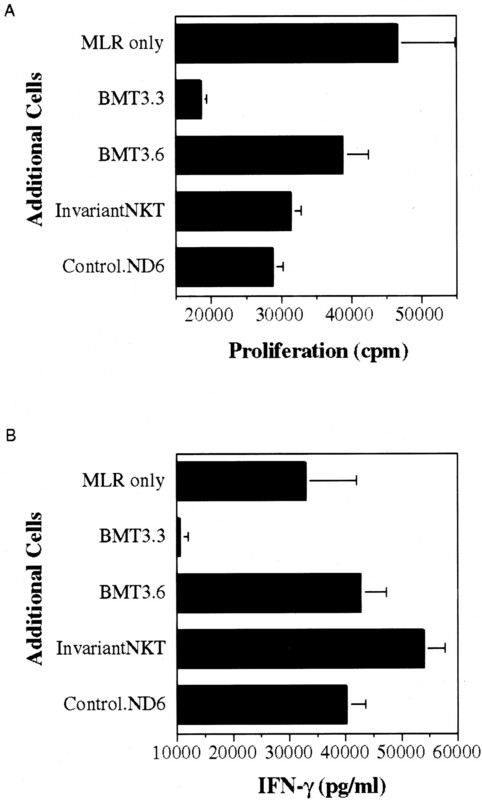 Human BM similarly contains cells that can suppress MLR (25, 26) and GvHD and induce tolerance to allografts (27, 28, 29, 30, 31). We report in this work that human BM was highly enriched for CD161+ noninvariant CD1d-reactive T cells. In contrast to invariant NK T cells, BM-derived CD1d-reactive T cells had a marked Th2 bias, preferentially responded to hemopoietic cell CD1d, and could suppress MLR. Physiologically, these cells may regulate B cell development, and they have the potential to suppress GvHD in the context of allogeneic BM transplantation. Abs used, including CD1d-specific mAb, blood-derived CD1d-reactive invariant NK T cell clones, lines, and human mock, CD1a, -b, -c, or -d transfectants, as well as FACS analysis were as described (5, 7, 32). Healthy donor BM mononuclear cells (surplus from BM transplant harvests or from Poietics Technologies, Gaithersburg, MD) were sorted with CD161 mAb bound to anti-mouse IgG magnetic beads (Dynal Biotech, Lake Success, NY) and a panel of BM T cell lines was established by stimulation with PHA-P (Difco, Detroit, MI), IL-2 (100 IU/ml; Biological Resources Branch, National Cancer Institute, Frederick, MD), and irradiated autologous PBMC (5000 rad). Functional analysis of CD1d reactivity was performed as described (5, 7, 32), with invariant NK T cell lines or clones as controls. Inhibition of two-way MLR by BM T cells was performed similarly to that previously described (25, 26). Briefly, 1 × 105 PBMC each from two donors for each assay were mixed with equal numbers of CD1d-reactive BM T cells or controls for 5 days. Proliferation and cytokine measurements were performed as previously (5, 7, 32). All results are shown with SD. Expression of NK cell markers by lymphoid cells in BM from healthy donors was investigated by flow cytometry. In comparison to PBMC, conventional NK cells (CD3−CD161+) were somewhat more common among BM lymphoid cells, while conventional T cells (CD3+CD161−) were much less frequent (Fig. 1⇓A). 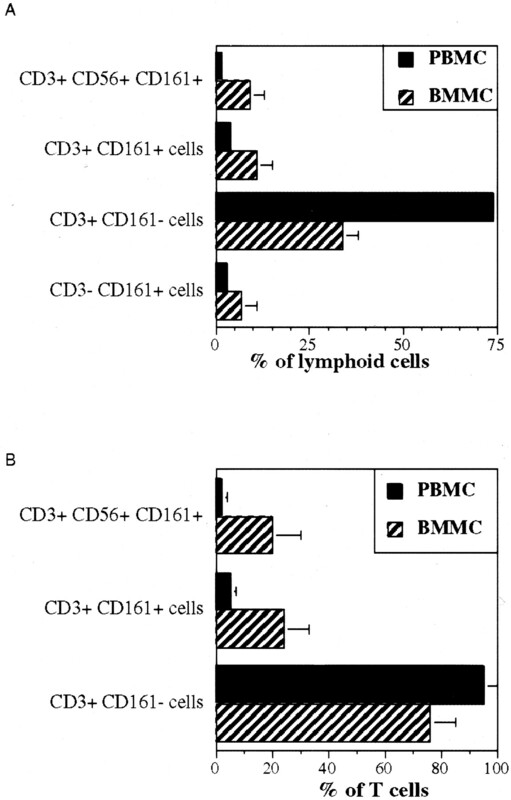 CD3+CD161+ cells were ∼2-fold higher among BM lymphoid cells, as were CD3+CD56+CD161+ cells. Higher CD161+ T cells were more evident when they were considered as a fraction of T cells. Approximately 25% of CD3+ cells in BM were CD161+, vs ∼5% in peripheral blood (Fig. 1⇓B). CD56+CD161+ T cells were also higher in BM, but T cell expression of CD56 and CD161 only partially overlapped. In contrast to the elevated numbers of NK T cells in BM, few Vα24+Vβ11+ double-positive invariant NK T cells were detectable in BM (mean 0.01%; data not shown), which was comparable to or less than in PBMC (mean 0.04%). Therefore, BM T cells from healthy donors were enriched for NK T cells, but not for invariant NK T cells, relative to PBMC. Phenotype of BM-derived lymphoid cells. Summary of FACS analysis of peripheral blood (n = 10) and BM (n = 4) mononuclear cells, gated on lymphocytes. NK T cells were stained with CD3-FITC, CD161-PE, and CD56-CyChrome. To assess CD1 reactivity, human CD161+ BM T cells were purified by magnetic bead sorting and a series of short term lines were expanded following one round of limiting dilution cloning. Significantly, only two of 20 independent BM T cell lines from three individual donors contained measurable levels of cells expressing Vα24 or Vβ11 (donor 1, 0/6; donor 2, 1/5; donor 3, 1/9) (data not shown). Instead, RT-PCR with a series of TCR α- and β-chain primers identified diverse TCR usage with different patterns of one to three dominant Vβ expressed by these T cell lines. Of six CD161+ BM T cell lines tested, all were either CD4+ (3/6) or CD8+ (3/6), with no significant double-negative populations (data not shown). BM-derived CD161+ T cell lines were next tested for responses to CD1+ target cells. Similar to previously described invariant CD161+ T cell clones (5), the BM-derived T cell line 2.F4 specifically produced large amounts of IL-4 in response to CD1d+ C1R transfectants, but not to CD1a, -b, or -c (Fig. 2⇓A). Modest amounts of IFN-γ were also produced by BM CD1d-reactive T cells, particularly after more than one round of expansion (Fig. 2⇓B). CD1d-specific cytokine and proliferative responses could be completely blocked by anti-CD1d mAb (Fig. 2⇓B and data not shown). However, 2.F4 responded only to CD1d expressed by C1R cells and not the HeLa transfectants, whereas invariant NK T cells responded equally to both (Fig. 2⇓B). Because both invariant NK T cells (5, 7) and BM CD1d-reactive T cells expressed the costimulatory molecule CD161 but different TCR, these results suggest that the latter cells can recognize a CD1d-presented C1R-specific Ag distinct from that recognized by invariant NK T cells. CD1d reactivity of CD161+ BM-derived T cells. A, CD161+ BM T cell line BMT2.F4 (two rounds of stimulation) and established invariant NK T cell clone DN2.D6 (several rounds of stimulation) were incubated with C1R (EBV-transformed B cells) or HeLa (cervical carcinoma) human cells transfected with human CD1a, -b, -c, and -d as described (7 ). IL-4 release was determined at 48 h. Limit, ∼50 pg/ml. Representative results from five independent experiments. B, CD161+ BM T cell line BMT2.F4 (three rounds of stimulation) and invariant NK T cell clone DN2.B9 for comparison. CD1d-specific mAb 51.1 or isotype control was included (10 μg/ml) as shown. Representative IFN-γ results from three independent experiments. C, CD161+ BM T cell lines (one round of stimulation), established invariant NK T cell clone (DN2.D6; several rounds of stimulation), and newly established invariant NK T cell lines (invariant MT and GB; one round of stimulation). Ratio of IL-4:IFN-γ (picograms per milliliter) production is representative of three independent experiments shown. In total, 11 of 20 BM NK T cell lines tested (5/11 from donor 2 and 6/9 from donor 3) specifically recognized CD1d+ human B cell transfectants, as measured by proliferation and cytokine secretion (Fig. 2⇑C and data not shown). CD1d reactivity of BM T cells did not correlate with a particular Vβ chain usage, and only two of these 11 CD1d-reactive T cell lines (one from each donor) contained measurable levels of Vα24+Vβ11+ invariant-like cells. Interestingly, all the cells in one of the CD1d-reactive lines containing Vα24+Vβ11+ NK T cells were CD8+, as were two other noninvariant BM CD1d-reactive T cell lines, while all described invariant NK T cells in humans and mice are CD8−. Further studies are needed to determine whether this reflects distinct selection for BM CD1d-reactive TCR or coreceptors. A further difference between BM-derived CD1d-reactive T cells and invariant NK T cells was lower levels of IFN-γ production relative to IL-4 by the BM-derived cells soon after establishment in culture. IL-4/IFN-γ ratios of CD1d-reactive BM T cells after one round of stimulation were much greater than those of invariant NK T cell clones and newly established control invariant NK T cell lines from healthy donors (Fig. 2⇑C). These findings indicated that healthy donor BM-derived CD1d-reactive T cells were strongly Th2 polarized relative to healthy donor invariant NK T cells, but like invariant NK T cells of cancer patients (33). Invariant NK T cells produce functionally significant amounts of other cytokines as well as IL-4 and IFN-γ (5, 17). These can include relatively nonpolarized cytokines and chemokines such as GM-CSF, RANTES, and IL-8; the Th2-like cytokines IL-5 and IL-13; and more regulatory Th3 cytokines such as TGF-β and IL-10 (5, 17). However, only a fraction of CD1d-reactive BM T cells could secrete RANTES (2/5: ∼300 pg/ml) and IL-13 (1/5: ∼4000 pg/ml), and only a trace of TGF-β was observed (2/5: <50 pg/ml). There was no detectable IL-8 or IL-10 production (<10 pg/ml). Therefore, CD1d-reactive BM T cells expressed a strongly Th2-biased phenotype (high IL-4 and little IFN-γ). Because of the high frequency of CD1d-reactive T cells in BM indicated above, responses of freshly isolated BM cells to CD1d were assessed. Unfractionated BM mononuclear cells responded specifically to CD1d-transfected C1R cells with IL-4 secretion at levels comparable to PHA responses, whereas PBMC did not demonstrate detectable CD1d-specific cytokine (Fig. 3⇓A). There were no such responses to CD1a, -b, or -c transfectants (not shown). 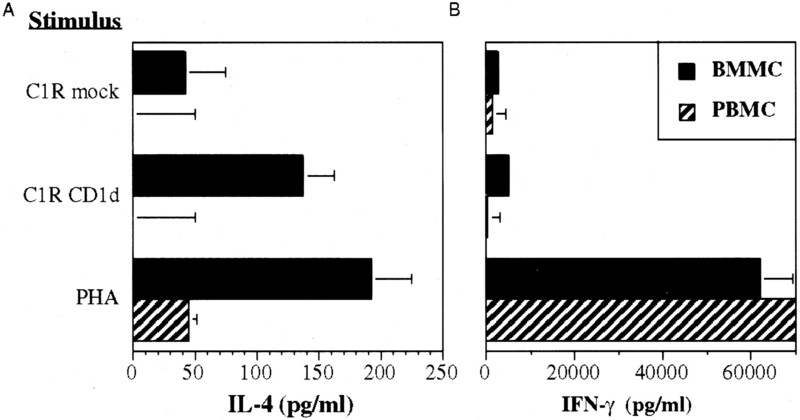 In contrast to IL-4 production, there was relatively little CD1d-specific IFN-γ secretion by fresh BM mononuclear cells (Fig. 3⇓B). These results confirmed the high frequency of CD1d-reactive T cells in BM and the strong Th2 polarization of these cells ex vivo. CD1d reactivity of BM-derived bulk mononuclear cells. IL-4 and IFN-γ CD1d reactivity of intact BM and PBMC, representative of three independent experiments. Next it was determined whether the MLR-suppressing activity identified previously in human BM (25, 26) could be mediated by CD1d-reactive T cells. BM-derived CD161+ CD1d-reactive T cells specifically suppressed two-way MLR, whereas neither CD161+ CD1d-nonreactive BM T cells, invariant CD1d-reactive T cells, or other control T cells had such an inhibitory effect (Fig. 4⇓). Both proliferation and IFN-γ secretion were inhibited by BM-derived CD1d-reactive T cells (Fig. 4⇓, A and B). These results indicate that CD1d-reactive T cells can mediate the MLR-suppressing activity in human BM. Effect of CD1d-reactive CD161+ T cells on MLR. BM CD1d-reactive T cell line 3.3, control BM non-CD1d-reactive 3.6, invariant, and control peripheral blood clones were incubated with two donor PBMC for 5 days (two-way MLR). Representative results of two independent experiments. A, Proliferation. B, Separate IFN-γ response from A. These results identify CD161+ CD1d-reactive T cells, distinct from invariant NK T cells, as a major T cell population and source of IL-4 in human BM. The BM-derived T cells responded to CD1d expressed on a B cell line and their physiological role could be to aid in B cell development through IL-4 production, as indirectly supported by recent data (34, 35). Alternatively, their MLR-suppressing activity and Th2-like IL-4 production may contribute to protecting developing B cells from potentially autoreactive Th1 cells in the BM microenvironment. In either case, these results, in conjunction with previous murine and human data (13, 21, 22, 23, 24, 25, 26, 27, 28, 29, 30, 31), indicate that BM-derived CD1d-reactive T cells may regulate GvHD in allogeneic BM transplantation and contribute to allograft tolerance. Therapeutic expansion of such cells in the setting of hemopoietic cell transplantation may provide a means to suppress GvHD, which complements the potential graft-vs-tumor activity of other NK T cells (15, 16, 33, 36). We thank Drs. L. Lanier and A. Poggi for reagents and Drs. M. Brenner, S. Porcelli, S. Strober, and S. B. Wilson for comments on the data or manuscript. ↵1 This work was supported by National Institutes of Health Grants CA89567 (to M.A.E. ), CA84156 (to R.S. ), and AI42955 (to S.P.B.). ↵3 Abbreviations used in this paper: BM, bone marrow; GvHD, graft-vs-host disease.